The principles of Reiki--a Japanese-originated spiritual healing art-- are collectively called The Reiki Creed. There have been many different variations of this creed written over the years. Getting certified as a Reiki practitioner is the first step in choosing Reiki as a career. Although Reiki is more of a calling than a choice. Most Reiki practitioners do not make a career out of it. Gassho is an intentional ritual typically performed by a Reiki practitioner before and after a full-body Reiki treatment. Palms are placed together in the traditional prayer position and held directly in front of the heart. A prayerful acknowledgment is then said quietly out loud quietly or thought silently in the mind. Gassho is a ritual of gratitude, offering thanks to the universe for making Reiki energies available, and for the opportunity to facilitate Reiki flow. Absentia--or distant--healings can be conducted with or without the use of surrogates. The most common surrogate used is a stuffed animal. It is common practice among Reiki II and Master/Teacher level practitioners to give an absentia treatment to clients the evening prior to their scheduled appointments. Conducting a preliminary absentia healing helps to ready the client's receptivity to Reiki energies prior to his arrival for an in-person session. An absentia pre-treatment often prepares the client for receiving a deeper or more profound healing. A Reiki tower can be used anytime you have two or more practitioners treating one spot on a client's body. Typically used during a Reiki Share whenever a blockage is discovered. Once a cold or stagnant spot is identified, hands are placed one on top of another much like stacking bricks. Two practitioners will create a four-hand tower, three people create a six-hand tower, and so forth. A ten hand tower is the max, any more is not recommended. 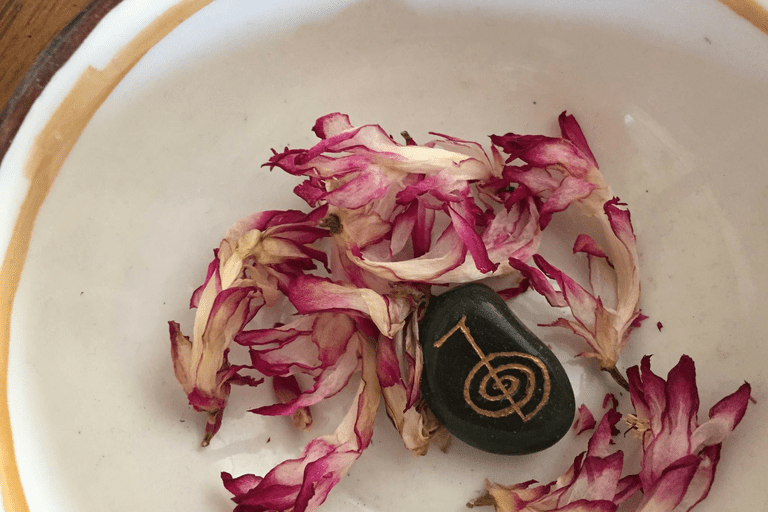 This combined focus, along with the visualization of the Reiki power symbol can help break through the blocked region in a reduced time—super speed. Reiki practitioner will often charge objects with infusions of Reiki energies and symbols. These objects include food that is to be eaten, a pillow that a head rests on, a doorway before walked through, etc. Crystals and gemstones are commonly charged with Reiki. A stone can be carried or worn. A Reiki healing stone can also be taped to the palm of the hand while sleeping or during surgical procedures. Reiki energies can be transmitted into the future as well as into the past. A few examples for projecting Reiki into the future include job interviews, before scheduled surgical procedures, and prior to upcoming court sessions. Walking into an interview, a meeting hall, a courtroom, a new school, a social gathering, or anywhere else is less intimidating when the Reiki energies you've sent in advance greet you at the door. Sending Reiki backward in time is also beneficial. Simply use your intent to send to a specific past event that was troublesome. Or, focus the energies on healing your inner child at the exact moment she was injured years previously. An easy way to do this is to hold an old photo between your palms while conducting absentia Reiki. Choose a photo that was taken of you as a child around the period of time you are wanting to heal. Targeting Reiki energies to be sent to the original hurt is also helpful in healing any reactive influences that resulted from that time. For example, whenever offering healing to a hurtful event in the past you are also clearing away carried-over traumas felt present day. It is absolutely safe to receive a Reiki treatment during pregnancy. Babies and toddlers too! Young children are especially receptive to Reiki energies, so you can expect a session to go much quicker. It is likely the child will let you know when they are done. You may have heard that cats and dogs love Reiki and many do! However, just like people, some animals are less receptive to Reiki than others. Try to take a cue from your pets; it is best not to force Reiki on an animal that simply won't lay still, or would be left alone. As for animals living in the wild, it is best to use absentia healings for them.